Rebecca Dirks from Premier Guitar interviews JD, Jason Mraz's tech around 2010. At around 3:15, JD states that Jason uses a BOSS Digital Reverb, and the RV-5 with settings is pictured. In addition to a delay pedal, Adam Beyer uses this Boss RV-5 pedal for reverb (hooked up to his Allen & Heath mixer) during his DJ sets. "It's a series of reverbs just set for different size rooms," says Josh Klinghoffer's guitar tech. At 34:40 Mike Hickey, Bonamassa's tech, and Rebecca Dirks of *Premier Guitar* talk about the pedals that Bonamassa uses with the [Category 5](http://equipboard.com/items/category-5-joe-bonamassa-model-combo) amp. Right next to the Giga Delay is a Boss Reverb pedal. Look closely, and you'll notice It has stereo input. Thus, it is the RV-5 model. 11:05 in this Rig Rundown for Troy Van Leeuwen of [The Wongergirls](http://equipboard.com/band/the-wondergirls), [Queens of the Stone Age](http://equipboard.com/band/queens-of-the-stone-age), [Enemy](http://equipboard.com/band/enemy), [Failure](http://equipboard.com/band/failure), [A Perfect Circle](http://equipboard.com/band/a-perfect-circle), [Sweathead](http://equipboard.com/band/sweethead), and [The Desert Sessions](http://equipboard.com/band/the-desert-sessions), his gear is displayed, showing a Boss RV-5 Digital Reverb Effects Pedal. The official Deep Purple site states that Airey uses a Boss RV5. "I have a Ratt pedal and an MXR Custom Comp pedal [CSP202]; Boss Reverb [RV-5] and Tremolo pedals [TR-2]; and I use a Line 6 DL4 Delay Modeler for a few things just so I don't have 15 other pedals on the board. But the Strymon TimeLine, oh my God. Oh man, it's just unbelievable. It can do so many things. " - excerpt from Ultimate Guitar interview. In these stills from Blur recording the "Magic Whip", Coxon's pedalboard is seen, with one pedal being the Boss RV-5. Welch's Boss RV-5 is mentioned at 16:25 in this rig rundown video. When asked about how he works with guitar pedals, Tom Smith says he mostly plays acoustic guitar and leaves the pedal work to the lead guitarist. However, he does mention liking and using the Boss RV?5 Digital Reverb Pedal: "...a pedal I always dig out is the Boss Digital Reverb pedal [RV-5], which has a modulated reverb setting which sounds like glass breaking, an icy, cold texture. That's been a recent addition to my live setting, as something that can be pulled out for dramatic effect." Original MusicRadar article [here](http://www.musicradar.com/us/news/guitars/editors-talk-new-line-ups-and-new-directions-596728/4). this image is from a premium guitar article on fall out boy's Monumentour gear. 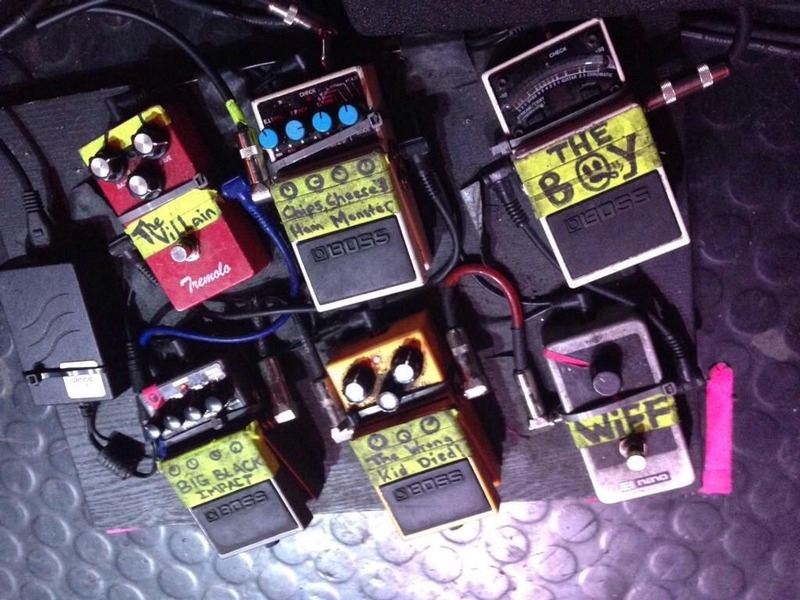 it shows all of patrick stumps pedals for that tour. 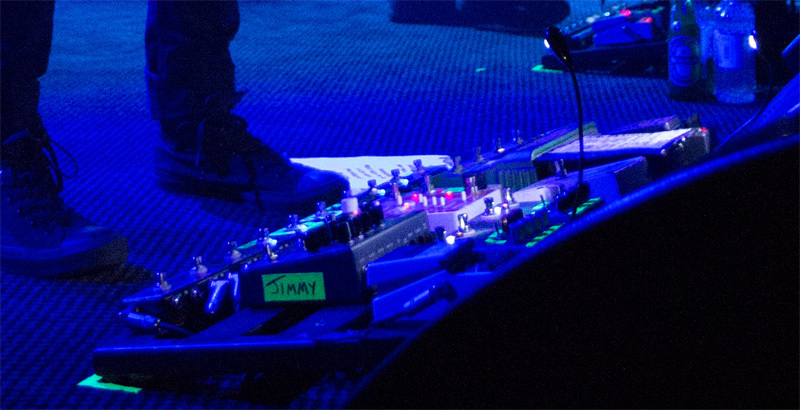 In this 2008 pedalboard photo (which is his pedalboard because it looks almost identical to his [2010 one](https://flic.kr/p/93aWUe)), the Boss RV-5 reverb pedal is visible. At 4:32 Jay's Pond pedal board can be seen containing the pedal (bottom second left). A Boss RV-5 can be seen on Visitante's pedalboard in this photo. At 19:59 of this video, John's technician points out that for one song, John uses the Boss pedal. This pic is from studio. The pic was taken in 2012 or 2013 approximately. At 9:55 in this Rig Rundown for James Shaffer of [Korn](http://equipboard.com/band/korn), his gear is shown, displaying a Boss RV-5 Digital Reverb Effects Pedal. One of the reverbs he uses. The grey pedal to the right of the big purple pedal is a Boss RV-5 reverb pedal. He may run his vocals through this pedal into the Akai Headrush. Seen here on his pedal board. Carl uses a Digital Reverb pedal in his effects rig, seen at 10.13 in this video. 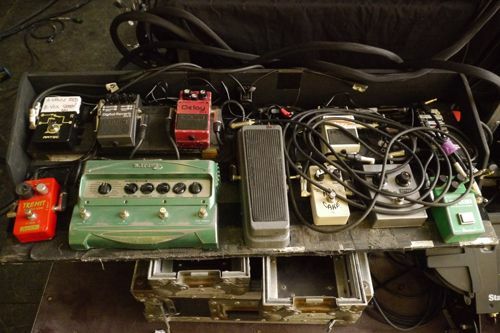 In this diagram (formerly on guitar.com) we can see Jesse's guitar rig during a tour in support of Brand New's landmark album 'The Devil and God are Raging Inside Me'. 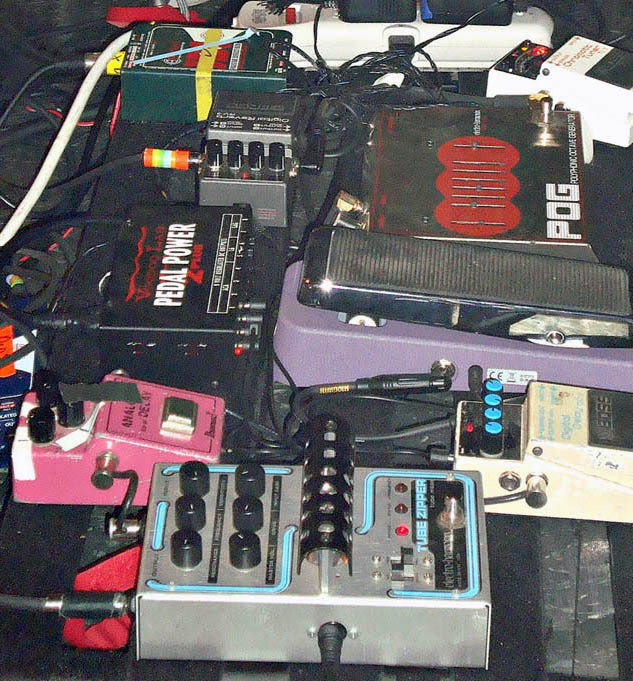 In this diagram, we can see that Jesse had a Boss RV-5 on his pedalboard. Would you go as far as saying RV-5s are crucial to the Raveonettes sound? Oh, they’re 100 percent crucial. I don’t think I could play a show without them. It’s the best-sounding spring reverb I’ve ever heard. Nothing compares to it. I don’t know how they did it, but it’s absolutely amazing. I haven’t heard a plug-in, an amplifier, or anything that sounds as good as that spring reverb. I have no idea how they were able to get such an amazing sound. It’s pretty crazy. "I also use the Mod setting on the RV-5 but turn the tone way down so there's modulation on the reverb, too, which sounds very cool." "I don't use anything fancy. I'm not really into fancy guitar stuff. Just [Boss] RV-5 reverb." J Mascis points out his Boss RV-5 Reverb Pedal at 17:20 in this Rig Rundown from Premier Guitar. 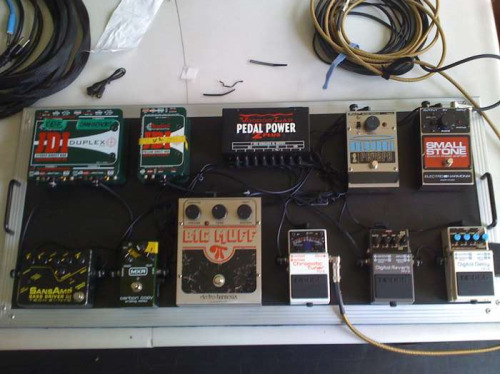 On his web site Bortnick details the collection of pedals that he uses, including this one. Brian's reverb pedal, which is used sparsely. "I got the delay and reverb in the effects loop." Seen at 0:53, can be assumed to be the same as Paul's. During an interview w/Gizmodo.com, Reggie Watts talks about his Boss RV-5 [@ 0:39] "And then I'm going into this Digital Reverb, it's an RV-5, and it's kind of a classic reverb pedal, it generates different types of reverbs... so it gives me nice reverb control." A Boss RV-5 Digital Reverb can be seen in the picture attached to this pedalmaniacs.com entry. Finally, at the far right, just out of sight, is a black pedal in the style of Boss with stereo input. So, it must be the RV-5. According to Guitar Geek's rig diagram, Ekstrom uses the Boss RV-5 reverb pedal. At exactly 12:36 you can see a close-up on the Boss RV5 sitting on Jade's rack-board. A little bit before that, he says that is his main reverb. 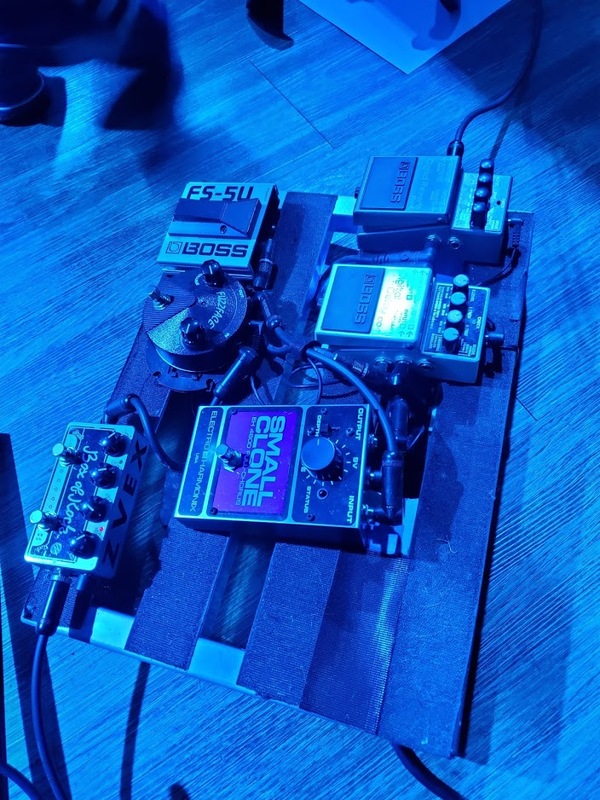 According to this photo of his pedalboard, he has Boss RV-5. At 0:39, this video shows Mark Engles of [Dredg](http://equipboard.com/band/dredg) with his pedal board containing a Boss RV-5. At 5:14 Jon describes his use of this pedal for it's big stereo sound. He talks about liking the pedal's ability to preserve the note within the reverb effect, "rather than just adding a big splash to whatever you do." In this video from Fearless Records, we see one of the guitarist and front-man of Pierce The Veil, Vic Fuentes, showing his touring rig. At this point in the video, he shows us the Boss RV-5 Digital Reverb Effects Pedal in the upper left of his rack shelf. In this video from Fearless Records, we see on one the guitarist of Pierce The Veil, Tony Perry, showing his touring rig. At this point in the video, he shows us the Boss RV-5 Digital Reverb Effect Pedal. His go to reverb that he runs stereo. An RV-5 can be seen on Justin York's pedalboard, in this Twitter image. 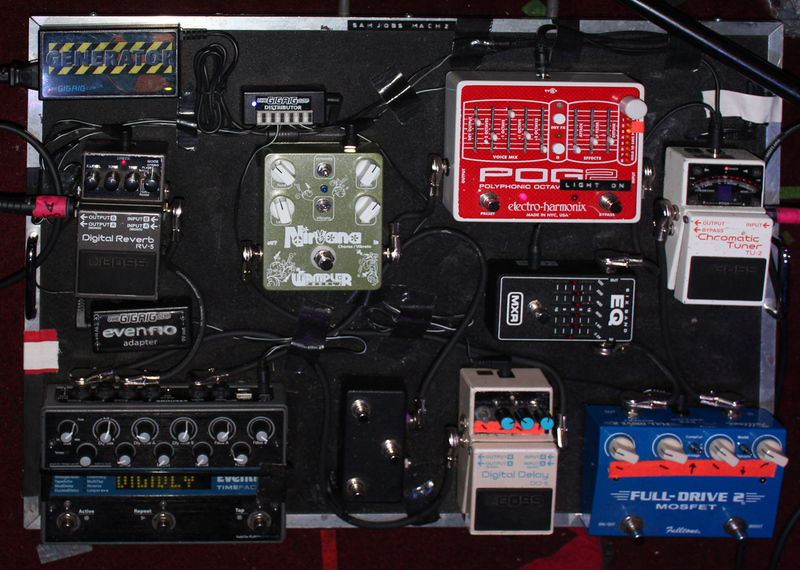 At 21:10 in this rig rundown video, a Boss RV-5 can be seen on Lee Malia's pedalboard. In this photo of Payseur's pedal board you can see the Boss RV-5 Digital Reverb. According to Premier Guitar, Rowsell uses the Boss RV-5 digital reverb pedal. After the Q Zone is a Boss RV-5. An RV-5 can be seen next to the Boss DM-2 and above the Line 6 DL-4. Visible in a picture of her pedalboard. You can tell it's the RV-5 based on the stereo ins and outs. Toby Shows his Boss RV-5 Digital Reverb Effects Pedal at 2:39 into the video. At 4:24 in the video, Michael mentions his Boss RV-5 pedal. Light reverb he uses to add to his tone. He uses this for all of his reverb. Mainly on the "Mod" setting. "You have an RV-5 Digital Reverb pedal. Do you use that for just a hint of reverb, or for a more obvious effect? In the studio, I’ll use it for effects. I’ll tweak it and get some cool stuff out of it. It has a lot of cool features to it, and if you want to roll the knobs around while you’re playing you can get some really crazy things that I think are cool, frankly. [Laughs.] But live, on stage, I put it on a light plate and just leave it on the whole show. I never turn it off." "Just waiting to replace the RV5"
He uses this for the modulation setting. 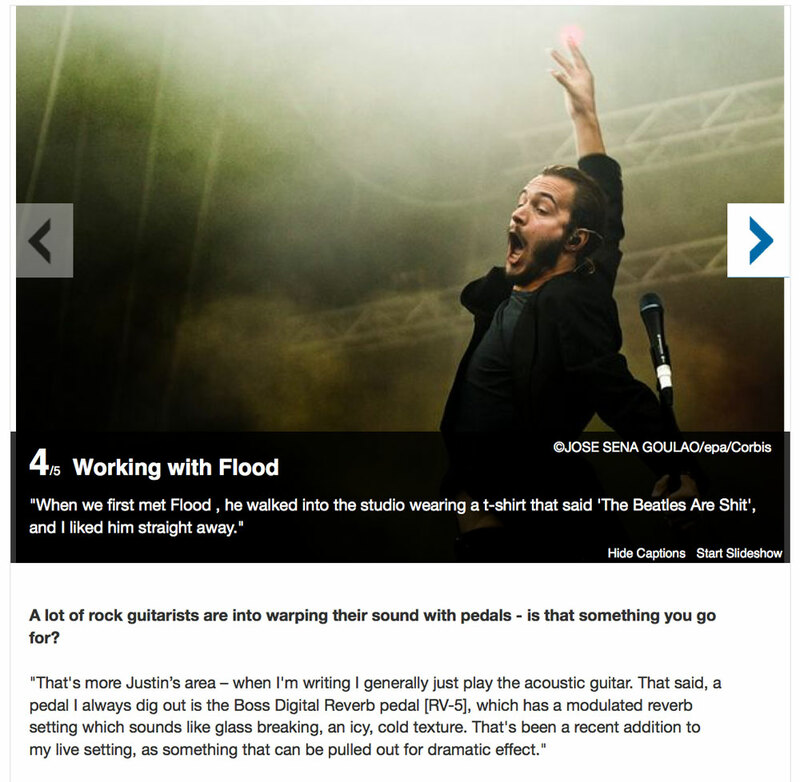 From a [Guitar World Article](http://www.guitarworld.com/caspian-s-guide-creating-wall-sound-four-essential-pedalboard-tricks), Jonny's signal chain continues past the DL4 to a Boss reverb pedal. Fender was with Beach Fossils at El Rey Theater and they shared all this on Instagram. You can see the KRV-5 next to the DD1. Screenshot made from Fender's Instagram. This was the first track I 'officially' recorded as part of my CCCL project (aka: Chris Carter's Chemistry Lessons). It was made in 2007 with a Gameboy ASP running a couple of Nanoloop sequences: into a Boss PQ-4 parametric EQ, mono out: into a Boss PN-2 Panner (square-wave pan setting), stereo out: into a Boss RV-5 reverb (Gate setting), stereo out > into a Boss DD-6 digital delay (modified), stereo out: into a Mac G5 recording (via MOTU 828 mkII audio interface) into Apple Soundtrack Pro. All realtime tweakery (mostly the PQ-4 + DD-6) and no post-pro no editing. "A small photo tour of the Amulets studio." This photo comes from Mono's 2010 Brudenell Social Club performance. 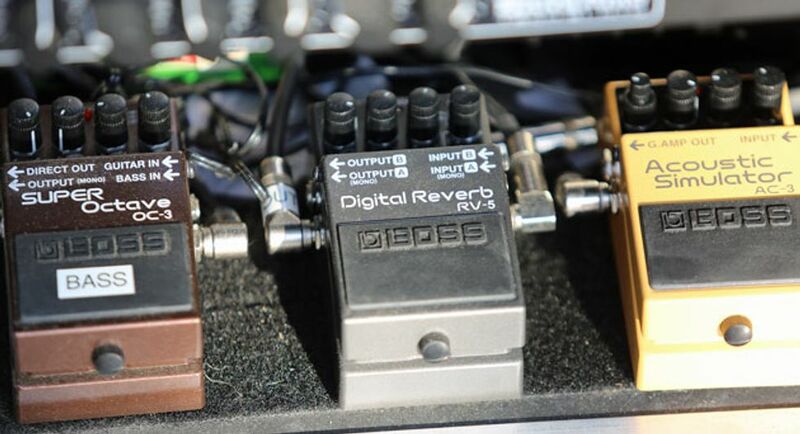 One of the pedals that can be seen in Taka's pedalboard is Boss RV-5 digital reverb. Can be seen in the youtube video. In Pedals Fusion's 2015 interview with Atsuko Chiba, Kevin showed off his pedalboard, which included a Boss RV-5. The item can be seen 15:17 into this video. The Boss RV-5 Digital Reverb Effects Pedal can be seen at the top of the right-hand side picture posted by Hanno Busch on his official Instagram account. At 4:23, Mike says he also uses a Boss RV-5. [Stated @ 4:22] This entire video is dedicated to a showcase of his different software, instruments and material he uses to make his music. Picture of pedal board, taken at the the V11, Rotterdam show on the 24th of March 2018. Under, fourth from the left. You can see a Boss RV-5 Digital Reverb on this picture of Chiaki Sato's pedalboard from her Instagram account. "Pedals: Klon KTR T-Rex Mudhoney Strymon Timeline - http://amzn.to/2h8BCek Boss RV5"
He uses RV-5 Digital Reverb. It has many modes including some usable (hall), some meh (plate), some awkward (spring), and, at last, its gorgeous one which most justifies its digital nature: a very nice sounding modulated reverb (think of an angelically chorused one)! Tweaking decay and level helps a lot about manipulating the intensity of the effect while tone helps a lot about defining its character (darker or with more presence/sharpness). Nice spillover bypass. Epic reverb sounds and so much freedom with the controls. If you want real Reverb, try this! All the modes give very clean, clear and round sounds , nothing to say ....... it's BOSS ! This pedal is awesome for ambient type stuff and is just what I was looking for in my reverb pedal. It can be used for adding a bit more fullness as well. Great stuff. Modulate. Tone all the way down. Or Tone all the way Up. Excelente Pedal. Possui muita qualidade em todos os modos. Sou fã dos delays e reverbs BOSS. this is a superb reverb emulating a range of sounds including decent spring reverb emulation. one of the best Reverb pedals I've tried. It was between this and the tc hall of fame. The hall of fame is better for the looks. But apart from that a all around good pedal. Great pedal!!! I originally used it as a 'chorus' emulator when I didnt have a 'chorus' pedal, but since then I've used it to add depth to my tone as well as another boost for my lead solos.